Public speaking is a huge fear for a lot of people. Fear of embarrassment. Fear of forgetting your speech. Fear of saying something that you may be judged on. Fear of failure. However, depending on your job and your role within the company, you may be asked to step up to the podium at some point and speak before a group of people. The first time will always be the most nerve-racking experience, but like with most things in life, with the more practice you get, the better you will become at it. 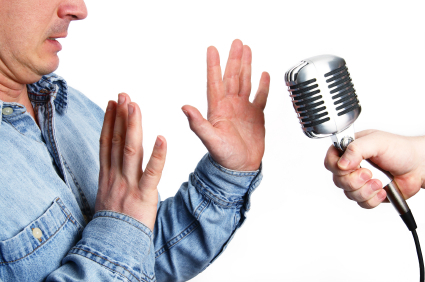 Here are a few tips to help you overcome your public speaking jitters. Practice Makes Perfect. It’s better to take the time to practice and even do some dry-runs either in the mirror, or better yet, with some friends who can give you constructive feedback. The more you know what you’re going to say, the more natural it will come from you when you’re up there in front of everyone. Know Your Audience. It is important to know your audience and what kind of culture they may have. Most people can appreciate a light amount of humor to a speech, which keeps them engaged and entertained throughout your message as well. But, knowing your audience and what interests them and what kind of “language” they speak will help you in the long run. Take a Java Break. Not as in go on a coffee break, as in take a break from coffee and other caffeinated drinks. If you’re already nervous and jittery, the last thing you need is to add to the mix. Stay away from caffeinated and alcoholic drinks up to 12 hours before you need to speak. Find an Outlet for Your Nervousness. If your nervousness comes out in the form of shaky hands or a shaky leg, or perhaps sweaty palms, find a way to combat this nervousness. Some people combat shaky hands by hanging onto something small throughout your speech. Some combat shaky legs by walking around and moving along the stage. Whatever works best for you, find it and put it to use. Have Fun! The last, but certainly not least, tip is to have fun. Smile, enjoy yourself and try to be yourself. Your audience will respond more to someone that is positive, upbeat and will be able to develop a much better rapport and connection with you if you’re your natural self. So, relax and remember that it’s really no different than talking to one person and have fun! As you become more accustomed to speaking before others, you will find that these tips won’t be necessary except for having fun and being yourself. Most people get nervous and jittery from fear of failure. The only true failure comes in not trying or giving up too soon. So, put these tips to good use and get to speaking!